AU $240,000 Per Share	Need Finance? AU $240,000 Per Share	Need Finance? Need Insurance? Description: Leopard Catamarans 47 : 50% Share Encumbrance Check? Designed in collaboration between the architect Alex Simonis and Robertson & Caine. The Leopard 47 is the best combination of space, performance, quality and value. Built in Cape Town, South Africa and outfitted with US equipment, including complete electronics, generator and ducted air conditioning. The Leopard 47 features a galley up, private and spacious heads, an aft platform with direct easy access to the cockpit, and great performance under power and sail. With a rig that delivers easy handling and top performance and an immense cockpit for relaxing and entertaining, the Leopard 47 catamaran will take you to a world of pleasures few have experienced. This Leopard 47 is a 4 cabin / 4 bathroom version. Each cabin is fitted out with a very large queen size berth, plenty of storage including hanging lockers with shelving, courtesy lights, individual reading lights, roller blinds for privacy, full length mirrors, seating, large open shelves and individual fans. Single lever tap pull-out hose. Dish & cutlery drying recess with drainage. Cutting board doubles as cover for drying recess. Gas solenoid shutoff valve with control at switch panel & warning light at cooker. New solar 2017 4 x 200 watt, new charger inverter, new lithium batteries and battery monitor. A partner SHIP with a difference. 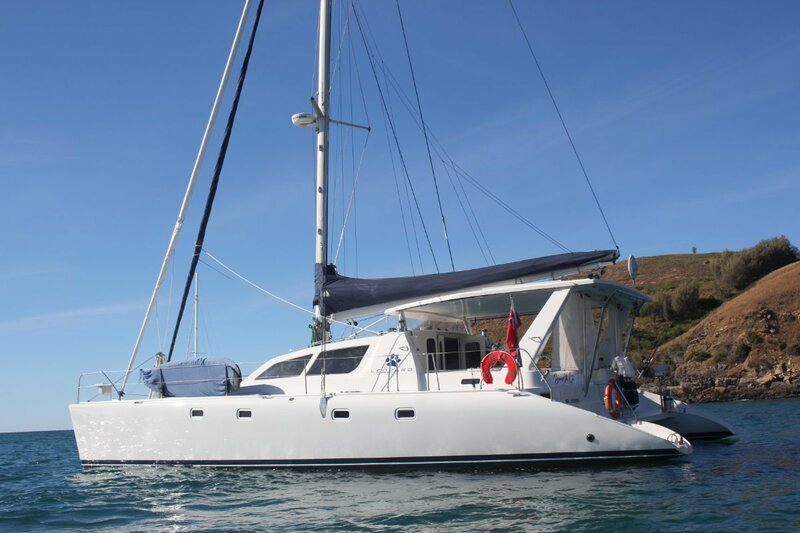 We are looking for a 50% partner in our extremely safe, comfortable and reliable upgraded 47 ft Leopard Catamaran "Somerset Cat" you may have seen us cruising the east coast of Australia over the last few years. Our much loved Cat has protected our family on many an adventure and for 3 years she was our permanent home. We have enjoyed some amazing experiences and she has taken us on our adventure of a lifetime. Unfortunately due to a change in lifestyle we are not using her as much as we would like to and as such we are looking for someone to share her with. Our ultimate dream would be to enable another couple or family the opportunity to do what we have done, share our experiences and discover the joys of a simple life cruising the coast, being at one with nature, meeting some wonderfull people and creating beautiful memories.. Somerset Cat is based in Brisbane during the summer months with easy access to Moreton Bay but we would ideally be looking at having her based in North Qld during the winter. If you have a dream to sail away and the desire to own a beautiful cruising catamaran with all the comforts of home and more, please give us a call and we can discuss this amazing opportunity. If we can not find the right partners we may look at selling 100% of the boat so if this is of more interest to you, again contact us if you would like more details.